G - Mature size 26" x 51"
15" x 9" waxy shiny grey green turning to shiny dark green, heart shaped, wide deep veined leaves that are upright, arching outward and have a wonderful pie crust edge. Pale violet flowers. The more mature the plant, the more prominent the veining and rippling. 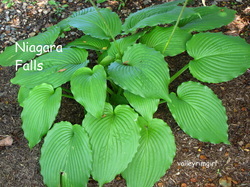 Very popular hosta! I bought this one for its looks as well as Niagara Falls is where my mom and dad went on their honeymoon.